Lighting has come a long way since Thomas Edison’s commercial incandescent light bulb. Today, LED models provide all of the benefits of incandescent models, but use at least 75% less electricity, produce less heat and last up to 25 times longer. On top of that, you can receive rebates when you upgrade. LEDs produce light in a whole new way. They provide excellent light quality in a wide range of color options and uses. And because they use at least 75% less energy than incandescent bulbs, LEDs are one of the most efficient lighting technologies available today. Since LEDs give off virtually no heat, they are the safest choice in home lighting and can help save on air conditioning costs. 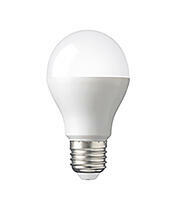 And since they’re extremely durable, they erase any concern over bulb breakage. Even the outdoor elements are no match for LEDs. Certain outdoor LEDs feature automatic daylight shut-off and motion sensors. Available in a wide variety of colors, shapes and sizes, LEDs offer a high degree of versatility. Some bulbs are compatible with specialty fixtures and dimmer switches. They’re also available in the form of holiday string lighting, which last up to 40 seasons. Look for the ENERGY STAR® logo for high-quality LEDs with independently verified performance, and a minimum two-year warranty. Be sure to pay special attention to the packaging of LEDs to make sure you’re getting bulbs compatible with your fixtures and personal preferences. For information about the changing system for labeling lighting products, visit LumenNow.org. © Copyright 2019 Great River Energy. All Rights Reserved.